THE visit of President Mahinda Rajapaksa to India assumes great strategic importance because of the untrammelled power that the Sri Lankan president enjoys after having decimated the LTTE and vanquished its leader V. Prabhakaran, besides having won an overwhelming mandate both in his own election and for his party in the parliamentary elections. THE Centre’s decision to reconstitute the Group of Ministers headed by Union Home Minister P. Chidambaram to examine issues related to the Bhopal gas tragedy is welcome, though belated. Union Law Minister M. Veerappa Moily has also hinted at framing a new law to provide adequate compensation to the victims of such disasters. THOSE who crib that cricket grabs too many eyeballs will have something to rejoice at least during the next 30 days. With FIFA World Cup kicking off in South Africa, the world will eat, drink and breathe only soccer for one month. There is no other tournament to match its colour, exuberance and passion. With every new outing, the tournament has grown bigger and better. TWO former Army Chiefs, Gen Shankar Roy Chowdhury and Gen V. P. Malik, and a former Vice-Chief of the Army Staff, Lieut-Gen S. K. Sinha, who has had the added advantage of serving as governor of two insurgency-ravaged states, Assam and Kashmir, have in recent days written thoughtful articles on combating the Maoist challenge. A fiduciary relationship between an officer and her Personal Assistant comes to mind as I traverse my years in the Secretariat. As a middle ranking officer, I was greatly in awe of a Financial Commissioner who had several departments under her eagle-eyed superintendence. On a certain day, I was summoned to explain my tangential suggestions regarding the promotion of ‘gobar gas and solar energy’ in rural Haryana. SAHIB, kanoon ka kaam garibon ko phasana aur amiron ko khiskana. Some years back a taxi driver had voiced this sentiment. The recent judgement in the Bhopal case now reinforces this widely held belief. While the Bhopal court has awarded the maximum permissible punishment, India’s Law Minister has described it as ‘justice buried’. The sentence is clearly a case of too little too late and exemplifies the systemic weaknesses of Indian justice. Reports of Myanmar’s nuclear ambition have raised concerns of international community regarding nuclear proliferation regime. A former major, Sai Thein Win, has publicised photographs of Myanmar’s nuclear programme. He was among one of the army officers who was sent to Russia for training in missile technology. He showed photographs of secret nuclear facility, 11 km from Thabeikkyan. AFTER truce, it is now time for bonhomie. In a sign that all is well with the Ambani household, Anil Ambani chose to stay at a guest house owned by his elder brother Mukesh Ambani’s Reliance Industries Ltd (RIL) at Tirumala during his recent visit to the hill shrine. A few days after the two warring brothers bought peace by scrapping the non-compete agreement, Anil visited Tirumala, the abode of Lord Venkateswara, and surprised everyone by staying in Sri Krishna Guest House owned by RIL. THE visit of President Mahinda Rajapaksa to India assumes great strategic importance because of the untrammelled power that the Sri Lankan president enjoys after having decimated the LTTE and vanquished its leader V. Prabhakaran, besides having won an overwhelming mandate both in his own election and for his party in the parliamentary elections. Mr Rajapaksa is a master strategist and the guile with which he has been playing the China card has made India tread cautiously with him. The Sri Lankan leader, however, knows only too well that Indian aid and support can come in handy for his country at a time when the economic recovery is slow on account of an economic slowdown. Mr Rajapaksa has also been under fire from the European Union on his controversial human rights record and a measure of acceptability in India will, he reckons, help him be seen in better light. Since Sri Lanka is right in India’s backyard, this country on its part has much to gain strategically from weaning him away from the excessive Chinese influence. A step-up in the Indian corporate sector’s participation in the numerous projects in Sri Lanka’s reconstruction would also be to India’s benefit. In that context, the seven agreements signed between India and Sri Lanka as a result of Mr Rajapaksa’s visit are welcome insofar as they break new ground in the areas of defence, space and energy security while strengthening the existing bonds through restoration of transport links, particularly a ferry service between Tuticorin and Colombo and between Rameshwaram and Thalaimanner; setting up additional consulates and initiating cooperation in the power sector. A treaty on mutual legal assistance in criminal matters and an MoU on sentenced prisoners also formed part of the package agreed upon. What India would particularly be keen to see is greater sensitivity to the plight of the Tamil minority in Sri Lanka and a devolution package to bring greater autonomy to the country’s Tamil-dominated eastern part. On this, Mr Rajapaksa has been largely non-committal though on this visit he has held out an olive branch. The Manmohan Singh government will indeed have to show deftness in dealing with a neighbour who needs to be handled with great tact and diplomacy. THE Centre’s decision to reconstitute the Group of Ministers headed by Union Home Minister P. Chidambaram to examine issues related to the Bhopal gas tragedy is welcome, though belated. Union Law Minister M. Veerappa Moily has also hinted at framing a new law to provide adequate compensation to the victims of such disasters. Admittedly, there is no “vicarious liability” in criminal law, as former Chief Justice of India Justice A.M Ahmadi has rightly said. The Bhopal court simply followed the rulebook and gave two years’ jail to eight officials of the Union Carbide India Limited and released them on bail. The nation was stunned at the development, but what could the lower court do when the accused went to the apex court and succeeded in having the charges against them diluted to Section 304A (causing death by negligence)? Surely, we need more stringent and tougher laws to deal with them to act as a deterrent. Compensation is another area that cries for attention. 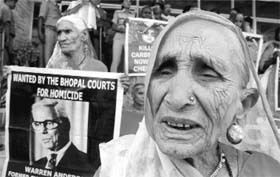 One reason for the raw deal given to Bhopal victims is the absence of a suitable law of torts in India as in the US and the UK. Unfortunately, even after 25 years of the Bhopal disaster, India does not have a formal law of torts which would allow victims of any industrial tragedy to move court for compensation. The people in the US and the UK enjoy a greater degree of protection against industrial disasters because of their time-tested tort laws. In the US, for instance, lawyers charge about 33 per cent of the total amount awarded under any court order or offered as a settlement to the victims as contingency fees. In the UK, there are various forms of collective action and other mechanisms to pursue group complaints. India doesn’t have the US system of award-linked fees; lawyers here can only charge professional fees, but high litigation costs and long delays plague the system. In India, though courts have extended the scope of civil damages, there is still no suitable law to deal with a Bhopal-like disaster. The Centre had enacted the Bhopal Gas Leak Disaster (Processing of Claims) Act, 1985, in a hurry without proper examination of all the issues. The legislation that Mr Moily is contemplating now should not only have a specific provision to deal with mass disasters caused by gross negligence in storing hazardous substances but also provide for speedy and adequate compensation to victims. THOSE who crib that cricket grabs too many eyeballs will have something to rejoice at least during the next 30 days. With FIFA World Cup kicking off in South Africa, the world will eat, drink and breathe only soccer for one month. There is no other tournament to match its colour, exuberance and passion. With every new outing, the tournament has grown bigger and better. The 19th edition is expected to break new ground in terms of reach and popularity, especially since this is the first time that the tournament has been hosted by an African nation. Those watching it on television might very well make it into record books. Like it or not, the lure of soccer is so powerful that it draws even those who have little knowledge about its nuances. The game has become so competitive that it will be foolhardy to hazard a guess about even the finalists, let alone the winner. Many may vote for Brazil and Argentina but then how can one forget Germany, Italy, France, Spain, Portugal and England? On their day, any of them can puncture the predictions. Many of the stars will be missed this time. While Brazilian coach Dunga has left out Ronaldinho, Alexandre Pato and Adriano, mercurial Mardona has ignored experienced Javier Zanetti and Esteban Cambiasso. But there are many hugely talented boys out there who can do anything to write their names in gold in the fable book of World Cup. These are the 30 days that the likes of Lionel Messi, Carlos Tevez, Robinho and Kaka have been waiting for. Organising a tournament of this magnitude can be an administrative nightmare. It is remarkable that things have finally fallen in place, despite many hiccups on the way. That gives some hope for the Commonwealth Games in India. India is nowhere in the reckoning in this battle of soccer giants. But that does not mean it is short on interest and enthusiasm. Whether it is Kolkata or Mahilpur, whatever happens in distant South Africa would be watched with bated breath, and dissected with expert precision. Let the best team win! In the headline “Hoax phone call from stolen mobile can spell trouble” (Punjab Page, June 6) the word “phone” is redundant. The headline “Karthikeyan 11th in NASCAR” (Page 22, June 6 ) leaves one perplexed as to what NASCAR stands for? The headline “Planning Tirupati darshan? Be decently dressed” and the deck “Dress code for devotees soon” (Page 24, June 6) mean almost the same. Hence, the deck could have been done away with. The highlighted para under the sub-head “Recruitment scam continues to haunt” of the lead story (Chandigarh Tribune, Page 2, June 6) has some inconsistencies like the use of “infamous” for “scam”and “storm” for “scam”. TWO former Army Chiefs, Gen Shankar Roy Chowdhury and Gen V. P. Malik, and a former Vice-Chief of the Army Staff, Lieut-Gen S. K. Sinha, who has had the added advantage of serving as governor of two insurgency-ravaged states, Assam and Kashmir, have in recent days written thoughtful articles on combating the Maoist challenge. The country in general and the Cabinet Committee on Security, now in the throes of finalising a comprehensive policy on this burning problem, in particular, would do well to heed their counsel. Since the CCS is grappling with the issue of using the Army and the Air Force to widen Union Home Minister P. Chidambaram’s “limited mandate” to fight what Prime Minister Manmohan Singh accurately calls the “biggest internal security threat”, it should give the most serious thought to their sound advice to desist. Their arguments --- that the Army is already “overstretched”, that if deployed against the Maoists it would need legal protection under the Armed Forces (Special Powers) Act which is under vigorous attack in the states where it is already in force, and that the presence of men in olive green in the deep interior of the country could enhance the existing “alienation” there - must not be brushed aside. The three generals do not say that the armed forces have no role at all in defeating the Maoists’ war on the Indian State. What they are opposing is the direct embroilment of the Army and the Air Force in counter-insurgency operations in the Maoist-infested areas. For instance, a vital role the Army can and must play is to train the personnel of the Central Reserve Police Force (CRPF) in jungle warfare. As it became evident after the April 6 slaughter of 76 policemen at Dantewada in Chhattisgarh of the company of the 62nd CRPF battalion that went on a botched up anti-insurgent mission, the bulk had had no jungle warfare training. Also, serving or retired Army officers can be posted to unified commands, headed by Chief Ministers, in the Maoist-affected states. Similarly, the Air Force can be of great help in logistical support to paramilitary and police forces and in surveillance that can be done by unmanned aerial vehicles (UAVs). But any offensive role by the IAF is almost certain to be counter-productive, if only because of widespread collateral civilian damage. Except once in Mizoram in extremely difficult circumstances in the sixties, India has never used air power or artillery while fighting internal insurgencies. Let this shining record be maintained. According to General Sinha, the 200,000-strong CRPF is the “largest paramilitary force in the world”, but though “equipped with modern weapons” lacks training in jungle warfare. “It is also the most overstretched force with poor logistics”, and besides being “ill-trained, it is also poorly led”. These shocking shortcomings have to be rectified rapidly. In this context, the lateral entry of Army jawans and officers into the CRPF (and other paramilitary forces) would be useful. What goes for the CRPF is even more relevant to the police in the states concerned. The training, discipline, morale and leadership of state police forces are even worse than those of Central paramilitary organisations. At the same time, without adequate rural policing and rural intelligence collection all the tall talk about rooting out Maoism would remain empty rhetoric. There are several other stumbling blocks to the effective action against Maoists that also have to be overcome. First, the controversy over whether combating Maoism is the responsibility of the states or of the Centre is nonsensical. Law and order is the states’ responsibility under the Constitution. But the Maoists are not creating just a law-and-order problem. They are waging an all-out war with the avowed objective of overthrowing the duly elected Indian government through armed force. All the constituents of the Union of India have, therefore, to respond with complete unity and coherence. Unfortunately, the problem is political, not constitutional. The time has come to cry halt to the absurdity of different state governments owning allegiance to different political parties going their own conflicting ways and the Centre arguing that its responsibility ends with providing the states with paramilitary forces. To put in place institutional arrangements to first develop a political consensus and then take coordinated action is not beyond human ingenuity. Secondly, the country and the government must realise that the first task that brooks no delay is to inflict on the Maoists greater attrition than is the case today. Indeed, during the first five months of this year the Maoists have killed 170 personnel of the security forces as against 108 Maoists that fell to the security forces’ action. The pattern was the same throughout 2009, and the statistics since 2005 are most depressing. Over this period the Maoists killed 1,189 security forces personnel and 1,647 civilians, while fatal casualties among the Maoists were 1,441. Is it any surprise that they are getting more and more emboldened? Of all the targets Dantewada in Chhattisgarh is the worst hit. Thirdly, and most importantly, the Prime Minister is quite right when he announces that in the fight against the Maoists, his government would seriously address the development problems at the grassroots and at the same time enforce the writ of the state firmly. Surely, he knows what the ground reality is. In most Naxalite-haunted areas, barring a few, there is no scope for development because the administration just cannot reach there. But even this is relatively unimportant. What is of paramount importance is that we have reached this appalling state of affairs because of woeful lack of good governance in the country over decades. Corruption is rampant and apparently irremediable. All political parties, indeed almost every politician, happily play politics with every issue, including ironically seeking Maoists’ support in elections. The police forces in all the states where the Maoists have a sway are unable to meet the challenge because they have been politicised relentlessly and remorselessly. Shamefully, every recruit to the police has to bribe his way in. The police in this country are not servants of the law, as they should be, but servitors of the party in power. Dr Singh has got to do something effective about this. Finally, one short point: After the attempted terrorist bombing at Times Square in New York President Obama summoned the US director of national intelligence, David Blair, and sacked him on the spot. Can there be such accountability in the great Republic of India? A fiduciary relationship between an officer and her Personal Assistant comes to mind as I traverse my years in the Secretariat. As a middle ranking officer, I was greatly in awe of a Financial Commissioner who had several departments under her eagle-eyed superintendence. On a certain day, I was summoned to explain my tangential suggestions regarding the promotion of ‘gobar gas and solar energy’ in rural Haryana. I entered the sepulchral room of the Personal Assistant, let’s call him Mr Aneja, and with other civil servants was made to sit on a rickety round-bottomed chair. Meanwhile, I found Mr Aneja simultaneously applying telephones to both his ears conveying the officer’s directions. Shortly thereafter there was a strong fragrance that preceded the Financial Commissioner’s arrival. When I finally gained entry I noted that the hall was large and I recalled an uncle, a member of the Indian Civil Service, who once told me that during the Raj, officers represented the paramount power in full panoply operating out of cavernous chambers where supplicants quaked as they approached the presiding deity. “Madam, I have read the files and sorted them out. There are just four bundles; Your Worship may now sign and pass final orders and I assure you that you will reach the club before the guests arrive,” Mr Aneja said. The Financial Commissioner sighed with relief and proceeded to affix her signatures to the first heap of files. “Madam, these officers have been placed under suspension.” Thereafter, the second heap was disposed of with the officers having got promoted while the third heap contained the fate of officers who had been chargesheeted. “Madam, the fourth heap concerns miscellaneous matters such as development and these can await Your Honour’s convenience. And now Madam, the day’s work is over,” said Mr Aneja exuberantly as he escorted the Financial Commissioner out of her chamber. Not surprisingly, the principal players have had their roles whitewashed. Union Carbide Corporation (UCC), of Eveready batteries fame, diversified into chemicals and pesticides. However, in the 1960s Netherlands disallowed UCC’s hazardous technology, opting instead for safer alternatives. The European pesticides market having thus dried up, UCC cynically decided to target the Third World, which offered cheap labour, low costs and lax safety enforcement. India’s Green Revolution boosted pesticides demand — a plum target for UCC’s hazardous process. GoI’s notoriously sticky wheels were oiled with suitable lubricants and soon, violating its own rules on foreign investments, UCC was permitted a majority share in UCC, India, ostensibly for its ‘induction of sophisticated technology’, ignoring the Dutch example. The Madhya Pradesh government received orders from ‘the very top’ to expeditiously clear the pesticides plant at Bhopal. It permitted the plant near the railway station, peremptorily overruling objections by a senior bureaucrat. From 1982, a series of vital decisions by UCC, USA directly caused the December 1984 tragedy. Neglected maintenance, curtailed staff and disregarded safety manuals became the norm. MIC, the deadly gas which was to cause the catastrophe, needed to be stored below 5 degree centigrade; but its refrigeration unit too was switched off! Cost-cutting entailed halving the work force by 1984 with severe safety implications. Operating crew for the MIC plant was reduced from 12 to six while maintenance crew dropped from six to two. Workers’ safety training was cut from six months to 15 days. By 1984, at least 61 MIC leakages had been detected by US-EPA at UCC, West Virginia. In May 1982, a safety audit by UCC, USA uncovered 30 major risks at Bhopal including 11 in the lethal MIC unit. The team warned of “high potential for a serious incident or more serious consequences.” In September 1984, another safety report in the US presciently identified the deadly possibility of a “runaway reaction in MIC storage tanks”. UCC’s American management was thus fully aware of design and safety shortcomings in Bhopal. Had the mass of safety recommendations been implemented, perhaps the December 1984 disaster would have been averted. On the night of December 2, 1984, a worker forced water to clear a blocked pipe leading to the container with 60 tonnes of lethal MIC. However, poor maintenance and non-functional safety systems allowed water to mix with MIC, triggering a runaway reaction. The plant supervisor failed to anticipate the enormous impending danger. Around midnight the runaway reaction exploded the concrete casing and deadly MIC spewed out. About 4,000 people perished within hours while 11,000 died lingering deaths. Lakhs were maimed or became incurably sick for life. The city of Begums became synonymous with the greatest catastrophe since Nagasaki. Now it has acquired a new notoriety – failure of the Indian justice system and the callous disregard for human suffering by the Indian state. Confirming common wisdom, the big fish have escaped scot-free. The culpability of the UCC parent had been excluded from purview of Indian justice system by our Supreme Court, which also diluted the charges from 304-II (culpable homicide) to 304-A (causing death by negligence). Further, the apex court brokered a settlement of $470 million for lakhs of victims against over $3 billion demanded. Warren Anderson was facilitated in fleeing India and selling the court-seized UCC shares, thus depriving the government of any leverage to get justice for its citizens from the errant company. The role of the top leadership in Delhi for permitting the hazardous technology while ignoring the Dutch example has never been subjected to public scrutiny. The MP government too cannot escape its criminal disregard for public safety by allowing the factory in the congested area. The state government was culpable at many more levels. Every factory is ‘inspected’ by 15-20 inspectors for compliance with a plethora of safety regulations. Yet none of them has been held accountable for failure to detect the blatant disregard of safety norms over several years. Besides, while thousands of citizens perished, not a single factory worker suffered — they simply held wet towels over eyes and noses. Even today, the state government continues to disregard public health hazards of the contaminated soil, still leeching poisons into ground water. Bhopal is unique only because of its catastrophic impact. The ‘cancer belt’ afflicting a fifth of Punjab has resulted from years of untreated poisons discharging illegally into Ludhiana waters. While Bhopal prompted the Canadian Chemical Manufacturers to adopt ‘Responsible Care’ — a voluntary high-safety regime — for Indian industry, business-as-usual remains its motto. The question confronting us is, has the law been deliberately kept weak even 26 years after the tragedy? The Bhopal verdict will embolden more cynical politicians, officials and moneybags to play with lives of the Aam Admi. The least homage we can pay to the Bhopal victims is to revamp our safety laws, particularly for fixing criminal culpability of public officials at every level. Otherwise, the impression that India is sinking into a Banana Republic would only be reinforced. Reports of Myanmar’s nuclear ambition have raised concerns of international community regarding nuclear proliferation regime. A former major, Sai Thein Win, has publicised photographs of Myanmar’s nuclear programme. He was among one of the army officers who was sent to Russia for training in missile technology. He showed photographs of secret nuclear facility, 11 km from Thabeikkyan. He described it as the army’s nuclear battalion and mentioned that Burma is also trying to build nuclear reactor for uranium enrichment. However, researchers have mentioned that Myanmar will take a long time to develop its own nuclear and missile facilities. A striking revelation is the North Korea’s nuclear connection with Burma. There were reported attempts to transfer sensitive technology to Burma from Japan in 2008 and 2009. Burma’s quest for nuclear bomb is due to the fear of the US intervention or by the UN-led coalition to enforce democratic regime in Myanmar. For the last 20 years, these fears are kept alive by the hostility shown by the international community and imposition of sanctions by the western powers. For example, in 2008, Burma refused to accept aid for victims of Cyclone Nargis. If Myanmar develops its nuclear and missile system, India will be surrounded by three nuclear weapons states — China, Pakistan and Burma. Both Pakistan and Burma have good relations with China which will be disadvantageous to Indian interests. The Pakistan-China axis is well known; China has even helped Pakistan in the development of nuclear and missile technology. Since 1988, Myanmar has emerged as a close ally of China, receiving economic and military help and also projecting Chinese power in the region. In 1988, China signed an agreement establishing trade across the border. Burma was isolated at that time due to domestic turmoil in the country and China opened up a trading outlet in the Indian Ocean. China’s navy sees Myanmar as an important route to reach towards Indian Ocean. The PLAN would be able to reduce the distance by 3000km by not passing through the Strait of Malacca to reach the Bay of Bengal. Besides providing military hardware help, China has also helped Burma to improve railway and road system. China has also build up facilities in Coco Island by establishing modern reconnaissance and electronic intelligence system. This is of big concern to India. India has tried to develop friendly relationship with Burma but it cannot be compared to Chinese influence. When there was domestic turmoil in Burma, the US asked China to exercise its political and economic influence to restore order in the country. Under such condition, India has to face one more nuclear ally of China which can degrade the security condition of South Asia. Another striking similarity between the three countries is that they all are hostile to the US. Pakistan may be an US ally but there is opposition among the people of Pakistan against the US policies, especially after drone attacks which have killed many civilians. As India, with pro-US policies, is the “odd one out” in the region, the US and India should deal with Burma’s nuclear programme. However, the problem is that President Obama is more concerned about developing relationship with China and Pakistan as compared to India. The US should understand that China won’t help in dealing with Burma’s nuclear bomb. The reason? China has been supporting pawns against the US. North Korea has been providing nuclear weapons to Burma. For it was because of China and Russia’s help that North Korea developed itself as a nuclear weapon state. China is the epicentre of nuclear proliferation. Pakistan is struggling to protect its country from extremism and to secure its nuclear weapons material. The acquisition of nuclear weapons by Burma will not only lead to a fragile situation in South Asia but lead to the failure of the US nuclear proliferation regime. In such circumstances, India is the only country left in the Burma’s neighbourhood which could provide help to the US to put pressure on Burma to end its nuclear ambition. The US and its European allies do not have cordial ties with Burma. It is very difficult for the US to convince Myanmar to give up its nuclear weapons. India could, as a mediator, allay Burma’s fears. The US should understand that it cannot win over nuclear proliferation alone and has to take the help of other likeminded powers in the region. A few days before the truce was worked out, Anil, along with his mother Kokilaben, had flown to the pilgrim town of Badrinath and offered prayers. If it helped break ice with his elder brother after five years of bitter legal battles, the Tirumala trip seems to have revived the warmth in the family. The central jail in Hyderabad will soon have a Business Process Outsourcing (BPO) centre. The unit will employ 200 educated convicts who will handle back office operations like data entry and process and transmit information. The project, a public-private partnership between the Department of Jails and an IT company Radiant Info Systems, will begin at Charlapally central jail which has 2,100 inmates. ”The idea is to ensure a good future for the educated convicts after they come out of jail,” C.N. Gopinath Reddy, Director-General of Prisons, said. The IT company officials said they had chosen Charlapally prison for the project because nearly 40 per cent of the inmates there were educated. A special office space has been created in the jail premises for the project, complete with computers, connectivity and other facilities. To begin with, over 200 people would be recruited and trained for the job. The unit, which is expected to undertake back-office work for banks, will work round the clock with three shifts of 70 staff each. This may well be the biggest gold transaction in the country. The Tirumala Tirupati Devastahanams (TTD), an autonomous board managing the affairs of Lord Sri Venkateshwara Temple at Tirumala, has decided to deposit its 3,000 kg of gold reserves in the State Bank of India (SBI). Apart from security and insurance cover, the TTD will also get an annual interest of Rs 8 crore for its gold. In the first phase, the TTD has shifted 1,075 kg of gold from its reserves to SBI for safe custody. The move follows growing security concerns. As per the current practice, the temple authorities transport gold from its vaults to a mint in Mumbai by rail to make coins, popularly known as ‘dollars’ which will be sold to the devotees again. Now, SBI will take the responsibility of keeping the gold with it and also transporting it from the TTD to safe custody, TTD chairman D.K. Adikeshavulu Naidu said.